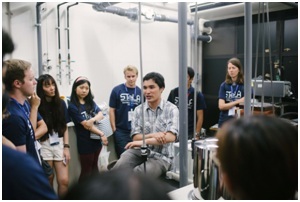 In August 2018, 32 students from around the world gathered at University of Tokyo, Japan. Participants are originally from Germany, Netherlands, Norway, Japan, China, India, Pakistan, Nepal, and the list goes on forever. During the forum, they were in undergraduates, masters or Ph.D program at their home university. During the forum a total of five session-types were held. 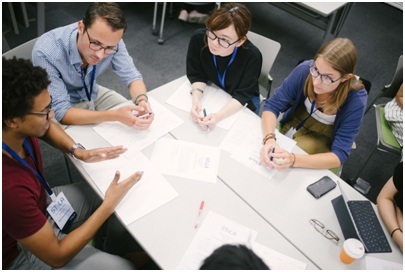 Leadership sessions teach participants about the core abilities of STeLA's leadership theory.Thematic sessions invoke discussions or serious games regarding science and technology and put the leadership sessions into perspective by connecting them to the forum theme. The thematic sessions are accompanied by three keynote speakers. During the forum the Site Visit gave participants the opportunity to view this year’s theme ‘Smart Cities and Internet of Things’ in some context: 2 laboratories of Tokyo University were visited. One laboratory was about e-skin and the other about a clean room for semiconductors. The forum has been concluded by a 4-day Group Project, where participants have applied their newly gained knowledge on science, leadership and teamwork to work on a large project together with their multidisciplinary, multinational team. Each day is ended with a Reflection session where first individuals are asked to reflect on their own performance during the day,also the group will give and receive feedback each other and their facilitators. The most important organization for VLSI design education in Japan is VLSI Design and Education Center (VDEC). It was established in University of Tokyo in May 1996. VDEC aims at the advancement of researches and education on LSI design in universities. It sends many distinguished VLSI designers into the industry and holds seminars and forums to exchange opinions among young professors, students, and designers. After 15 years of VDEC, education on CAD software, LSI design and design flow in universities was greatly improved. Now 153 universities and 640 research groups are members of VDEC and it has 9 branches in Japan. Over 1,000 papers are published through VDEC activities each year. Up to 404 chips were fabricated in 2004. VDEC has one of the clean rooms in Japan which is used by researchers, and students. Participants were taken on a tour of the clean room. The significance and the working of the clean room were explained. The clean room is shared by about 300 research groups. Someya Group have been dealing with Organic Electronics since the laboratory started in 2003. Organic devices have attractive features; such as its ease to be fabricated on plastic films, its thinness and flexibility, and its extraordinary durability from banging and bending. Research is focused on the bio-medical application of organic devices. The aim is to develop novel electronic devices that can harmoniously interface with living bodies by taking advantage of the inherent softness of organic materials and the remarkable features of organic molecules. Unprecedentedly light, and ultrathin, soft ICs, light-emitting devices, and solar cells are the latest achievements. Approximately 30 members are working in the lab. The backgrounds of the postdoctoral researchers and visiting researchers widely vary from electronic engineering, material engineering, to bio and medical background. The visit to the facility answered questions to the various ongoing researches about e-skin and the developed products. The participants were given chance to experience on of the developed e-suit which tracked the motion of the participant. Professor Yasushi Asami majored in urban engineering at the University of Tokyo until his master. Then he went on to the United States for his PhD in Regional Science in the University of Pennsylvania. In his speech, he talked about his recent research on the development of living environment and its evaluation methods. Takao Someya received his Ph.D. degree in Electrical Engineering from the University of Tokyo in 1997. Since 2009, he has been a professor of the Department of Electrical and Electronic Engineering at The University of Tokyo. During his speech, he showed us his recent project about a flexible screen attached on human body to monitor health conditions. Participants believed that the technology can be widely used in the near future.